Two landmark agricultural buildings in Paynesville were demolished recently: the Paynesville Co-op Creamery, razed earlier this spring, and Paynesville Grain and Feed, taken down last week. The two businesses, located on railroad property along Railroad Street on the eastern side of downtown, date back to the early days of Paynesville. The Paynesville Co-op Creamery was founded in 1888, when it was the first creamery in Stearns County. The surviving creamery was built in 1920. The Paynesville Elevator, also known as Paynesville Grain and Feed, dates back to between 1907 and 1910, when Cargill built the elevator in town. 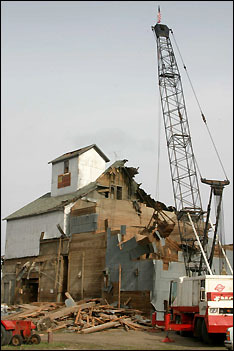 The Paynesville Elevator, also known as Paynesville Grain and Feed, was taken down last week. The elevator, along the railroad and Railroad Street, was built over 90 years ago. Earlier this spring, the Paynesville Co-op Creamery was demolished, too, to make room for a stormwater retention pond. Both buildings, located where Lake Avenue meets the railroad tracks, were taken down to make way for a stormwater retention pond planned by the city as part of the street improvement project this year. The Paynesville Co-Op Creamery was formed in 1888. According to a 1938 Press article, the original Paynesville Co-op Creamery was the first creamery in Paynesville, the first in Stearns County, and the second in the state of Minnesota. The creamery that was demolished this spring was the second Paynesville Co-op Creamery, built in 1920. According to the back issues of the Press, some of the equipment for the new Paynesville Co-op Creamery came from the Irving Creamery, which had closed in 1917. In the 1930s, farmers had separators on the farm and would haul cans of cream to the creamery to make butter. Local farmer Curt Wegner can still remember his father bringing cream cans to the creamery when he was a boy. Then they would bring buttermilk home to feed to their hogs. "I hauled two cans of cream five days a week (to the creamery) when I drove into high school with my dad's 1927 Chevy truck," recalled Lorraine (Manz) Fiscus, a 1938 PHS grad who now lives in Columbia Heights. "After school, I would pick up the cans of buttermilk to take back to the farm to feed the pigs, and it would be mixed with ground grain." In the early 1950s, as a young man, Wegner drove a creamery truck, picking up 10-gallon milk cans from area farmers, he said. The Paynesville Co-op Creamery made butter in Paynesville until 1958, according to back issues of the Press, when "it was deemed more profitableÉto make larger quantities at a central location," at the First District Association plant in Litchfield, which is part of the Land O' Lakes cooperative. For two decades, the Paynesville Co-op Creamery acted as a collecting station for milk before it was sent to Litchfield for processing. "As soon as bulk tanks came inÉ then our customers went down," remembered Myrtle Hoeft, who served as the bookkeeper for the Paynesville Co-op Creamery from 1960 until it ceased operations in 1980. At that time, producers were switched to shipping directly to Litchfield. The creamery stayed open for a couple months selling feed and other supplies for farmers, noted Hoeft. The Paynesville Co-op Creamery Board finally dissolved in 1998, disbursing $125,000 to 220 shareholders. Built in the first decade of the 20th Century, the elevator was known as Paynesville Grain and Feed for most of its life. A Cargill employee bought the elevator from Cargill. 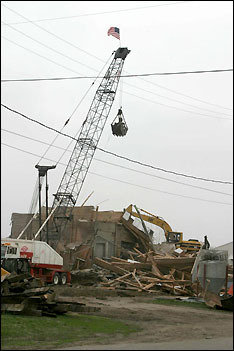 The 95-year-old elevator in Paynesville was demolished last week. In 1947, brothers Leo and Ted Tschann, who grew up on a farm just south of Northfield, bought the business. Leo Tschann would run Paynesville Grain and Feed from 1947 to 1975. "He really, really, really loved the elevator business. He found his place," said his son, Bob Tschann, who ran Paynesville Grain and Feed from 1971 to 1975 and still lives in Paynesville. "He was a farm boy at heart." In the early days, being located on the railroad was necessary to buy and sell grain, said Tschann. They would sell train cars of grain and get supplies by railroad: seed, coal, and other supplies. In fact, said Tschann, buying and selling grain was only part of the elevator business in the old days. The business was also a retail store for farmers, which is why Tschann used to answer the telephone as "Paynesville Grain and Feed, Seed and Weed, Mobile, Gas, and Fertilizer Company." In the heyday, farmers would come to town on a regular basis to bring their cream to the creamery and would stop for supplies on their way home, said Tschann. The elevator even ground and mixed custom feed for farmers. Tschann believes Paynesville Grain and Feed was one of the last coal dealers in town. Coal was once the prime source of heating for houses. Most elevators fell prey to heightened competition, said Tschann, especially in this area where most crops are feed to livestock. Gradually, other seed and feed dealers cut into the retail side, while truck transportation increased as well, negating elevator's advantages of being on the railroad. Whereas, at one point 95 percent of the elevator's grain was transported by train, by the 1970s, less than half was, estimated Tschann. The Tschanns sold Paynesville Grain and Feed to Paynesville Farmers' Union Co-op in 1975. The elevator had a number of owners, including Joe Kremer, before closing.